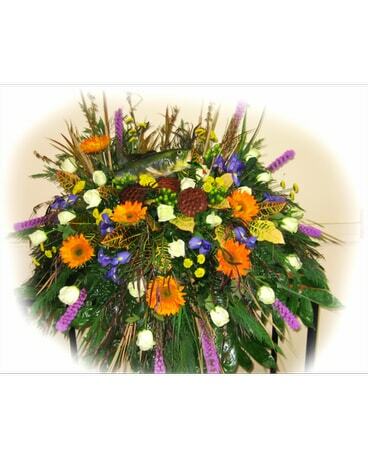 Gone Fishin' Casket Spray in Lake Charles LA - A Daisy A Day Flowers & Gifts, Inc. This is a nice casket spray for the man or woman who had a passion for fishing. Consisting of beautiful sunflowers, purple larkspur, grasses and greenery plus white roses and other flowers, it's simply beautiful. Some slight variation in flowers may be necessary due to availability.